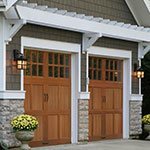 The finest garage doors, openers, & garage screens. Learn more! The strongest, most durable commercial products. Browse products. Your one-stop-shop for complete loading dock solutions. Take a look! Get to know our professionals. Meet our team.